The thought of infected mushroom in Risotto or mushroom curry might put off the foodies. But for the music buffs, Infected Mushroom, would be- well, music to their ears. The Israeli musical duo from Haifa produces and performs Electronica and will be a headliner band at the 10th edition of SulaFest, a festival of music, wine, food and fun. This band has millions of followers globally and gives around 120 live performances around the world every year. Infected Mushroom have performed at some of the biggest music festivals around the world including Coachella and Burning Man. Infected Mushroom has been twice ranked amongst the world's "10 Best DJ's" by the DJ Magazine of UK. 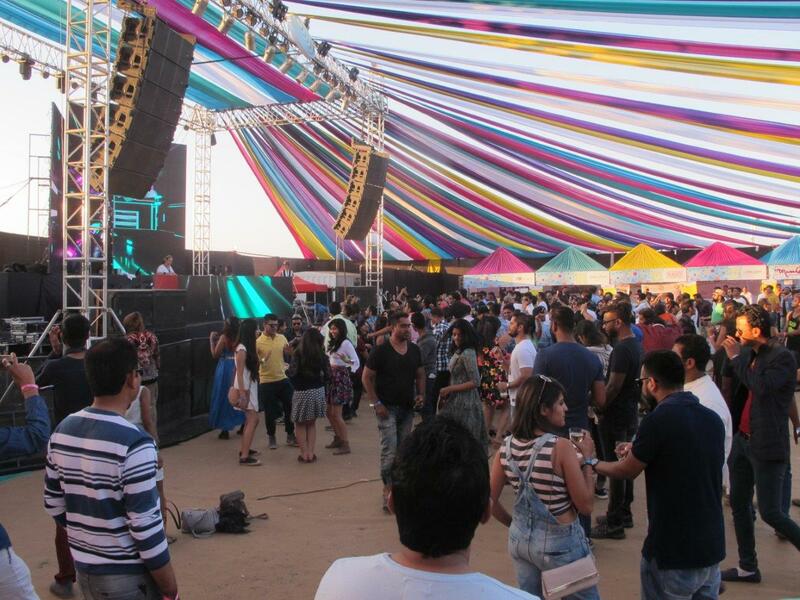 SulaFest has established itself as a venue where world class bands are invited to debut in India on the first weekend of February every year. Established in 1999 and with innumerable world tours and awards and four studio albums, Bloc Party, the indie (the term has nothing to do with India!) 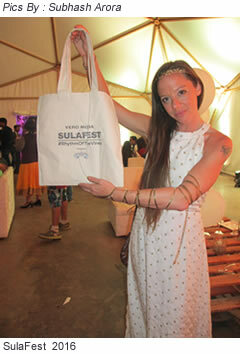 rock band from London will get this opportunity at SulaFest as one of the headliner bands. They will play tracks from their recently released album ‘Hymns’. Their track ‘Love Within’ was declared as the 'Hottest Record in the World' by BBC Radio 1. On the occasion of its 10th anniversary, Sula is dedicating the first day of the festival to Indian artists to celebrate and promote domestic talent. Visitors will get to enjoy some of the legendary acts like Nucleya, The Raghu Dixit Project and Indian Ocean on stage on Friday, 3rd February. The main stage (like Central Court at Wimbledon) is the original stage at the Amphitheatre where the main action is. Last year, one saw another huge stage Atmasphere created right on the vineyards; it gave ample opportunity to shake a leg too. To accommodate more bands, a third Tropical Stage is also being added for the 3-day activities that start at noon and go-on continuously till 10. 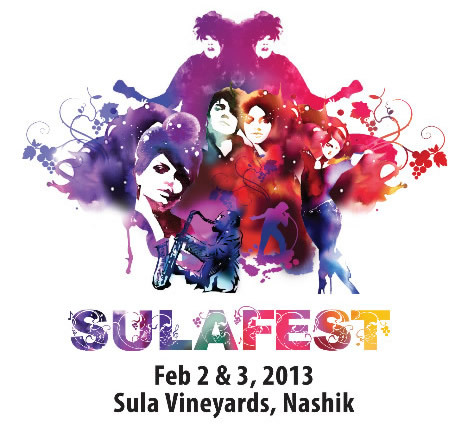 SulaFest is centered around music and wine-but not just that. There are traditional activities such as a run, yoga classes, foot massages, tarot reading, wine tours and tastings in the tasting room, grape stomping and a variety of other activities. You can also enjoy a wide selection of non-wine drinks including cold pressed juices, beer, vodka, whiskey, tequila, cognac and liqueur from around the world by Sula’s import arm Sula Selections and other importers who rent the stalls from SulaFest. The Bombay Food Truck, Busago, Mainland China, Maroosh and Woodside Inn are but a few of the eateries serving interesting food to go with the wide selection of wine and drinks. The sit-in restaurants at the vineyard - Soma and Little Italy will provide ample space for relaxed dinning. Unfortunately, Soleil by La Plage was shut down last year after the tragic death of the star Chef Morgan Rainforth. As we approach the 10th edition, delWine is pleased to give snippets from a few of the previous editions that I enjoyed attending and which give a peep into how the Fest has been evolving over the years and the changing trends since the maiden edition in 2008. For details, visit each Article for that edition separately, especially if you feel there is no continuity in writing; they are excerpted at places. The 9th edition of the ever-growing SulaFest-an annual gourmet world music festival for the wine and food lovers with a penchant for music, was another sell-out event filled with music, gourmet food, wines, a selection of beer and liquor labels and fashion, making it yet another memorable event for the 15,000-17,000 people estimated to have attended. The organizational acumen of Team Sula is impressive, matched only by the enthusiasm of the visitors pan-India and even overseas, but the facilities are now bursting at the seams. Although music with wine was the forte to attract young wine loving crowds from Mumbai, Rajeev Samant was savvy enough not to call it a music or even a wine or gourmet fest. He had the vision to make it a separate all-encompassing profit center that could be steered into any direction while promoting Sula wines and Brand Sula. This year 75% artists were international. If the Australian band Cat Empire got the crowd tapping their feet and dancing to their numbers that included ‘Rising with the Sun’ from their soon-to-be-released album, it was the Bollywood Sufi singer Kailash Kher with his band Kailasa, who mesmerized the crowd with his thrilling, popular Bollywood numbers. In the early days, it was not possible to estimate the full potential of the venue or the Fest with barely 300 people attending the maiden edition in 2008. What has made the event popular are the excellent musical Acts managed professionally by partners in the Fest. It’s always refreshing to meet winemakers- Ajoy Shaw, Karan Vasani and Rupali Bhatnagar, who debuted as one of the Top Ten Women of Wine in India in delWine in 2015, and discuss with them openly about the styles, quality, problems and various trends. It was a pleasure to see Dr. Neeraj Aggarwal, COO and Deepak Bhatnagar, VP and National Head of Marketing. I used to be very optimistic about the venue capable of handling 20,000 people, the number expected at the 10th edition, but this year the place was bursting at the seams. It is commendable that no untoward accident occurred with around 15,000-18,000 people (the official word was ‘over 10,000’ but the number was definitely more than last year’s estimate by journalists of 15,000). 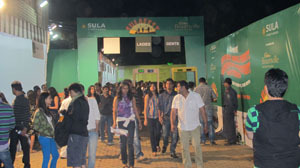 With the current facilities the venue cannot hold any more numbers, without creating stress and anxieties for the organizers- Sula and Vero Moda, no matter how efficient they were and despite a highly commendable job done by the young staff that prided itself for conducting successfully an event that would reverberate for the rest of the year. Traffic is a big headache for both the visitors and surely those manning it, which is reminiscent of Delhi snarls. It may be prudent to keep it for 3 days-at least next year when SulaFest reaches the 10th year for which the organizers have already announced they have grandiose plans. If Snapdeal can sponsor Big Boss or DLF can be a part of the IPL league title by parting with a sizable chunk of money, It’s not difficult to surmise that the enterprising Rajeev Samant, Founder & CEO, Sula Vineyards would have been sniffing around for the right partner to take this annual fun and frolic festival woven around music and wine (and other products promoted by Sula). 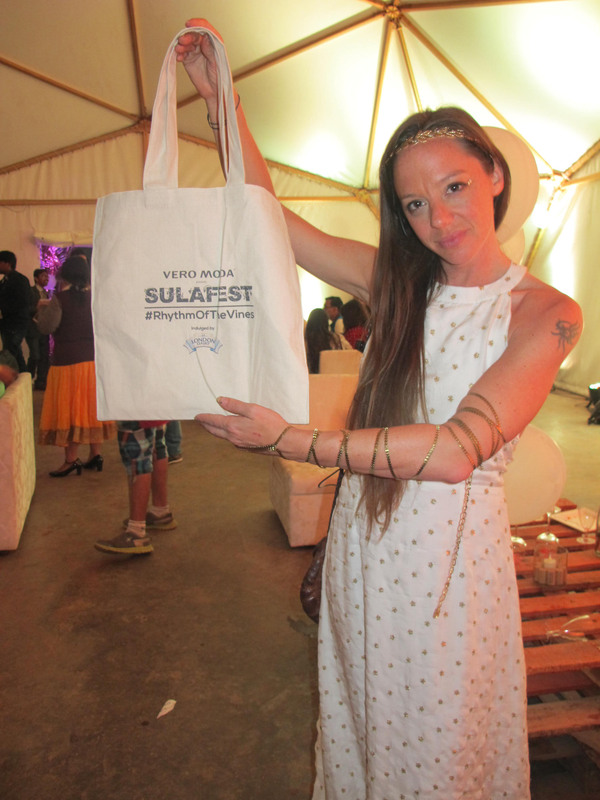 Vero Moda, the fashion brand (Vero means truly and Moda is fashion or fashionable in Italian) partnered with it last year under a 3-year contract which entitles the event to be titled as Vero Moda presents SulaFest. A few editions ago, Rajeev perhaps realized that they needed a music partner to take the festival to newer heights and establish it as a music festival as well. He partnered with the well-known Mumbai-based Blue Frog which has been creating an international buzz and has been adding popular foreign bands to the repertoire every year. This year’s line-up featured Young The Giant from California besides Will And The People, Nucleya, Yes Sir Boss, Speed Caravan, Swarathma, Cuban Beats and All Stars which was my personal favourite. Of course, Lucky Ali was the true rock-star of the event and was the darling of the crowd that went ecstatic connecting with him. Pulling-off successfully Sula does- Every year without any major incident! 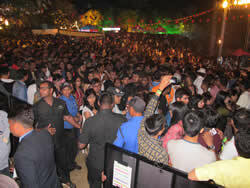 No one under the legal age of 21 is allowed entry-the marshals and bouncers ensure that. No one seems to be drunk- at least not excessively. No ogling of women by men and certainly no lewd remarks noticed anywhere. It is commendable that no drugs are seen either. While last year’s attendance varied from 5000-8000 depending upon who the figures were meant for, the amphitheater and the area around the winery were bursting at the seams and yet very well organised with no problem or major glitch one could see. Sula is pushing the button once again with the target being 8,000-10,000. If you really want to relive the days of the hippie generation of those days, there is a camping option for Rs.4400 for one night or Rs.6400 for both, organised by ‘White Collar Hippie’. 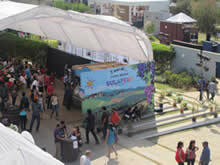 Although Delhi Wine Club has taken members to Vinexpo and Wine for Asia- Singapore in the past, this was the first time it organised a visit to Nashik as a part of celebrating the 10th year of its existence (2002-2012) and visited five wineries over three days, culminating at SulaFest- the ‘Indian Woodstock in the making’, an annual destination for wine and music lovers. To say that SulaFest brings back memories of Woodstock would not be too much out of line- the only difference apart from the size would be that too many young kids were smoking cigarettes-but unlike Woodstock they were filtered tobacco and not marijuana. Says Cecilia Oldne, ‘we are very particular about drugs and have security people all around to ensure it is drug-free.' Nowhere in India have I seen an atmosphere charged with music and friendship and clean fun. For me it was sheer nostalgia, bringing memories of my student days in the US. Around 4-5000 people occupied every inch of the space reserved for the event, be it the Tasting Room, grape stomping drums, food stalls, numerous bars selling Sula wines, beer and other cocktails made from imports by Sula Selections. It seemed that the prices were higher by a couple of notches on all the food and wine products, including the entry itself which though higher at 1500 allowed entrance for both days-the single day was at Rs.1000, nominally higher than last year’s Rs.800. The event was even better organised than last year- from parking to the toilets which were there in plenty but perhaps not marked well enough so quite a few were complaining about the inadequacy. Plenty of wine and food so no one could complain (except perhaps the price). The music was absolutely fantastic and it was an endless feast for music and wine lovers. The only unfortunate part was it had to be shut precisely at 10 pm, apparently due to city code. This was a feat that cannot possibly be duplicated in Delhi or the NCR and Sula deserves a standing ovation from all the music and wine lovers of India. I feel we are seeing an Indian Woodstock in the making- from 500 people in the first year in 2008 to 2-3000 last year and possibly 8000 this year- in a small town like Nashik. It is a great progression and soon infrastructure shortage will coincide next year with the grape shortage. 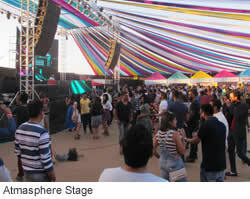 The fourth edition of SulaFest held at Sula Vineyards might be miniscule compared to Woodstock but over 3000 young people thronged the amphitheatre to enjoy an interesting day, away from the humdrum of a big city like Mumbai, although people from Pune, Nashik and as far as Delhi also enjoyed a day of wine, food, music and bonhomie, writes Subhash Arora who feels that events like this can be big wine promoters. At Rs.800 a ticket, just for the entrance, one would think there would not be many takers. But the ‘Sold Out’ board at the entrance of the vineyard early in the afternoon was an indication of the success that would later result in traffic jams around the vineyard, both at the entry and exit. It is a compliment to the organizers and the visitors that there were no incidents of misbehaviour, with the crowd completely letting their hair down. 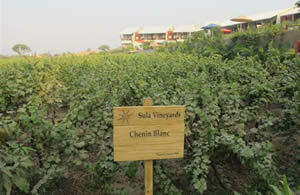 There were a couple of bars selling Sula wines by the glass at the Tasting room prices. Several food stalls had been set up and despite fears of a shortage of food, (wine would never be a problem, assured Rajeev Samant), the stalls were continuously being replenished with food. Distributed by Sula, Cointreau was the only non wine/beer beverage that the Cointreauversial stall making Cosmopolitans, seemed to use. It was so popular that the 48 bottles brought in for the evening were finished much earlier. Asahi beer also being imported by Sula was very popular at Rs.150 a pint whereas the diehards were happy with the Kingfisher at Rs.100. This year’s number was around 3000, almost double of last year. At this rate, next year would have the possibility of 5000 people attending. 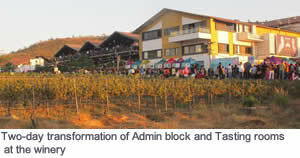 When Rajeev Samant, founder CEO of Sula Vineyards, built a Tasting Room and then the open-air Greek Amphitheater around 12 years ago, he said it could be used to organize musical evenings where a couple of thousand people could easily be accommodated. He might have even visualized a mini-Woodstock one day but could not have fantasized an overflowing house with about 20,000 people including the work force only a decade after starting a festival he eventually christened as SulaFest. Over the years, it has become a festival focused on music, engaging world-class Acts. I had sensed from the very beginning that it would become a mini Woodstock with wine. It has become a much bigger event with even international ramifications and is a Mecca for wine tourism. It goes much beyond the world of wine or even other alcoholic beverages imported by Sula Selection. However, music and wine are still its USP. 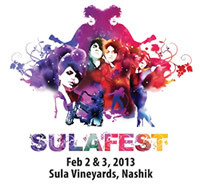 delWine has always maintained that even if you are not overly fond of music but love the good life and wine, at least one visit to SulaFest for a unique experience is highly recommended and what better time to go than for the 10th anniversary event which promises to rock the wine and music-loving gourmets! The special 3-day edition on February 3-5 also beckons those hooked to Indian Music and whisky, beer or brandy. Since part of the profits, I am told, go to several charities, you will be contributing towards a noble cause too (sorry, there is no income tax rebate for you, though). For further details and to book your tickets before they are sold out as they are every year, check out www.bookmyshow.com. Be prepared to shell out Rs. 2000-5,500 depending on the day or for the whole event. The site also gives a few hints for stay including tents. Unlike 5 years ago there is a wider choice ranging from OYO rooms to the Taj Gateway. But one needs to book in advance because with the growing number of visitors the shortage gets acute, especially for Saturday night.